Stenvar is a Nord warrior and a mercenary living in Windhelm. He can usually be found on the second floor of Candlehearth Hall. Stenvar wears a full set of steel armor, including a pair of steel gauntlets (two variants), and a pair of steel boots (two variants). He is equipped with an iron greatsword. Upon hiring him as a follower, Stenvar becomes a potential candidate for marriage. He can also be brought to Sky Haven Temple to be recruited as a member of the Blades. Stenvar may greet you with "Well, look who it is. Been keeping out of trouble much? I hope not!" or "If you need some skulls crushed, I'm still available for hire." When told to follow, he will eagerly say, "Good! Let's go find something to fight" But when told to wait, he will be more sedate, saying, "Patience isn't exactly my strong suit, but alright." And when told to leave, he will jibe, "You're letting me go? What's wrong, is my skill with a blade making you look bad? Hah! I'm kidding, friend. Until we meet again!" If you ask him to trade items, he will half-joke, "Sure, feel free to hand me all the gold you want." Stenvar seems to dislike caves as when you are in one he comments on how he can't stand the chill; when you are outside the entrance of one he says: "A cave, dark and dangerous." If Stenvar takes enough damage and is kneeling, he may not get up again and will be stuck in this position. ? If this happens, dismiss and hire him again. Attacking or shouting at him may also fix this. Mod Notes: The Use Pack Data flag in the GetIsID check is erroneously enabled. 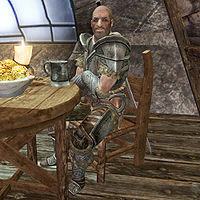 If Stenvar is forcibly dismissed from the Dragonborn's service during The Companions questline, he may disappear from the game and never return to Candlehearth Hall. ? This page was last modified on 13 February 2015, at 21:42.